Borrowing money is one of the options to pay for online degree but the question is to whom do you borrow money. Online universities provide financial aids, so the first thing to do is to talk to a financial advisor. Ask about the different kinds of financial assistance the school provides and what the school accepts. For most students, loan will play a big part of the financial assistance package. But remember this, it costs money to borrow money, with rising interest rates over time this will great impact the total amount of your education. So, only borrow what you need. Online students have a great advantage over students attending campus, they are only entitled to pay for their tuition and not so much on books because their course materials are all downloaded. When it comes to living expenses, they do not need one since some are already employed and some already have a house. And they do not have to relocate to attend school and not subject to out-of-state tuition. The next step in borrowing money to pay for online degree is to complete a Free Application for Federal Student Aid (FAFSA). The form can be filled out online through the Department of Education website or submit the form by mail. This application will be the basis to how much you will be granted for all federal, state and school programs. Always fill out forms a month or more before deadline this will give you more time to look for other options in case your application is denied. After filling out the FAFSA form, you are provided with a Student Aid Report (SAR). The federal government operates under the impression that your education should cost you something and that amount is the Expected Family Contribution (EFC). This information is based upon the your income savings, family size, and family members attending college. Schools that you have indicated in the FAFSA form will also receive this information. The EFC is the basis for determining your financial need (Cost of attendance – EFC = Financial Need). If in case your application is granted, you will receive a Financial Aid Award Letter from the university. 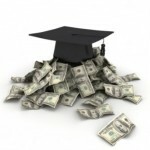 This indicates the total amount granted, loans, scholarships and work study where you are qualified. Borrowing money to pay for online degree is not a simple process though, not all applications are granted so make sure that you have another alternative at hand. I’ve always been averse to lending, but I will to further my education. A degree is worth many times more than what it costs.